Hash Auger has many features that help users reduce the electricity costs associated with GPU cryptomining. 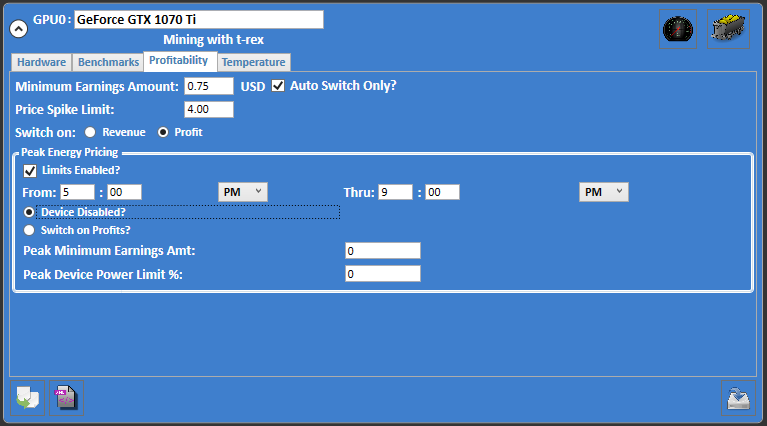 Any combination of these configuration settings may be used to balance mining performance with electricity consumption. Additionally, these settings can be defined for individual GPUs, so that the energy usage of less efficient video cards can be adjusted independently than that of more efficient models. A video card's power limit determines its electric consumption while mining cryptocurrencies. While higher power limits are typically associated with increased hash rates, there is a limit to how much extra power consumption will improve mining output. For example, increasing power limits beyond 100% usually provides a minimal increase in hash rates with much of the extra power being wasted as heat. Conversely, lowering a GPU's power limit will usually reduce electricity use while only slightly affecting daily earnings. Most users see an insignificant decrease in mining output after lowering a card's power limit to 80%. However, users are encouraged to evaluate a range of power limits to determine the most efficient levels for their hardware. 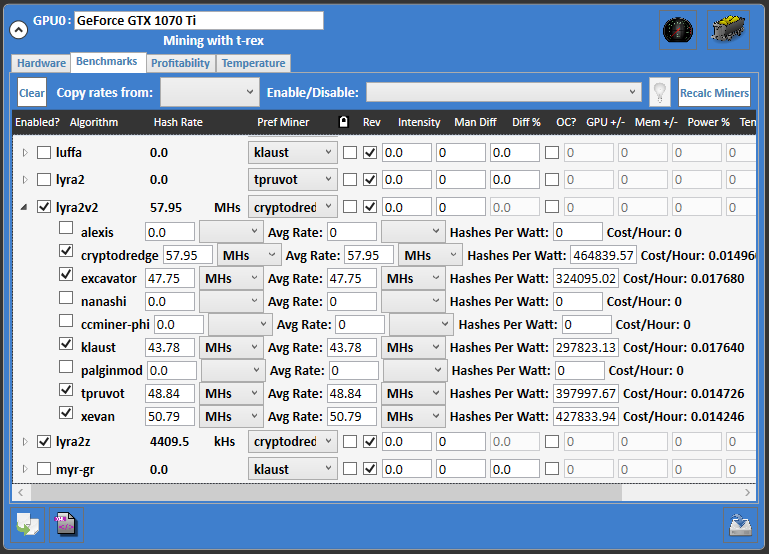 Hash Auger allows users to easily define a default power limit for each GPU using the Hardware tab for each device. Since some computationally intensive algorithms benefit from a higher power limit, users may want to define custom power limits for specific algorithms using the Benchmarks tab. When overclock settings are enabled for a GPU, Hash Auger first checks to see if the current algorithm has a custom power limit. If so, the software will use the algorithm's power limit setting; otherwise, Hash Auger uses the default power limit set for the GPU. Hash Auger will not change the video card's power limit if a power limit has not been defined for a GPU within the software's settings. Hash Auger can switch mining work based on estimated profits rather than revenue; profit calculations subtract the estimated electric cost from the estimated revenues. Unlike the few other algorithm switching programs that offer a similar feature, Hash Auger automatically determines energy costs for each algorithm and mining program while benchmarking. Energy costs are also revised automatically during mining for improved accuracy. In profit switching mode, Hash Auger selects both the most efficient algorithm and mining program to maximize energy savings. To use profit switching, users must provide a cost per kilowatt hour and enable GPU Monitoring in the software's config settings. Profit switching is then enabled for each GPU in the device's Profitability tab. If GPU Monitoring was disabled when GPUs were benchmarked, consider re-benchmarking all GPUs so that the software has the necessary electric usage information. Some users may prefer to only mine during certain hours, whether to reduce electricity costs or to limit cryptomining to times when the computer is not being used for other purposes. 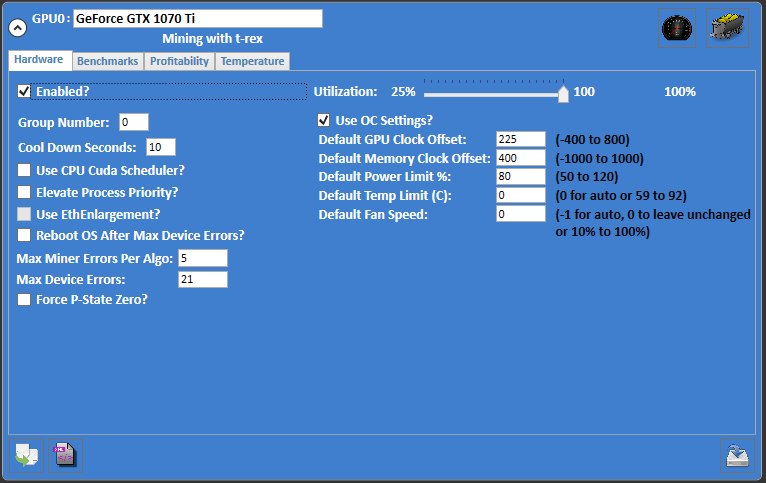 Hash Auger supports time of day mining using the Peak Energy Pricing settings on each GPU's Profitability tab. When limits are enabled, a GPU can be disabled between specific hours each day. Since these settings are configured per video card, users can disable some cards such as the primary graphics card while using the system while still mining on any other GPUs. Many electric utilities charge different rates during certain times of day. Often, times with higher electric rates are referred to as peak energy hours. In addition to suspending mining during hours with higher rates, Hash Auger features several options that allow users to still mine while reducing costs. For example, users can further lower each GPU's power limit, increase its minimum earnings amount to reflect the higher costs or use profit based switching during these hours. These settings are useful for users with renewable energy sources such as solar who want to reduce or stop mining when they are purchasing energy rather than producing it. For example, a user with a solar array may disable mining during overnight hours.